Front. Earth Sci., Nov. 2018, Volume 12, Number 4. Front. Earth Sci., Jul. 2017, Volume 11, Number 3. Front. Earth Sci., Oct. 2015, Volume 9, Number 4. Front. Earth Sci., Mar. 2014, Volume 8, Number 1. Front. 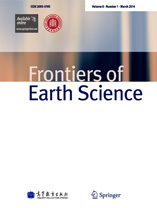 Earth Sci., Dec. 2011, Volume 5, Number 4.